Opening any sort of business such as restaurants and food chain demands large quantities of finances from the owner. Along with the business plans are the taxes that accompanies each purchase to be done by the owner ranging from buying the specific establishment for the restaurant up to the kitchen tools and equipment. For documenting these taxes, important tax forms are needed by the authorities to be filled out by the restaurant management and owner. How to Write a Receipt Form? Although general business tax forms are commonly used by most business owners, it is significant that the type of business that will be opened is properly highlighted in the document. With this, a restaurant tax form is used to indicate that a restaurant business will be operated and registered into the tax agency of the government. 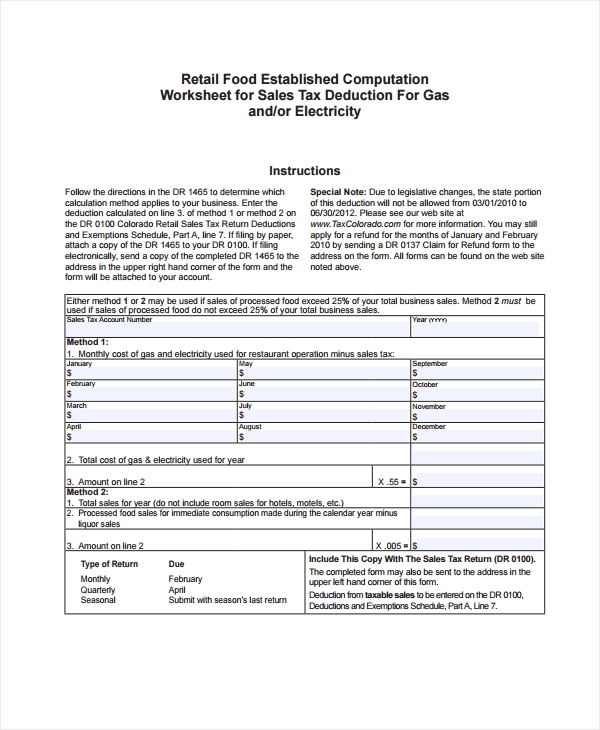 This form must be completed and presented to the authority along with other restaurant legal forms that are required for permitting the business. Assessing a restaurant business owner’s tax liability is the purpose of using a restaurant tax return form. 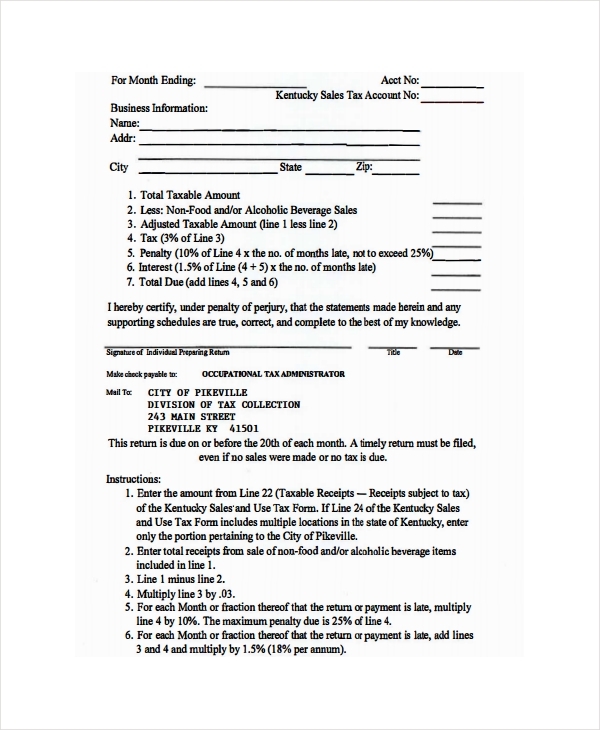 This tax form demands the report of the restaurant owner regarding his liquor purchases, the taxable receipts that he provides to his clients, as well as other taxes for his restaurant operation purchases. 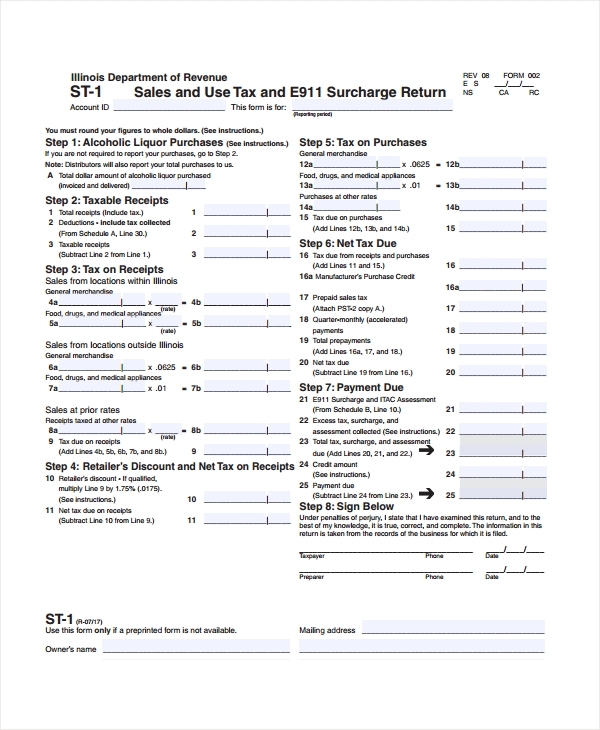 For reporting tax statements and records every month, a restaurant monthly return tax form is necessary to be used by the restaurant management. The benefit of using this form is that it allows the authority to gather updated and documented information. 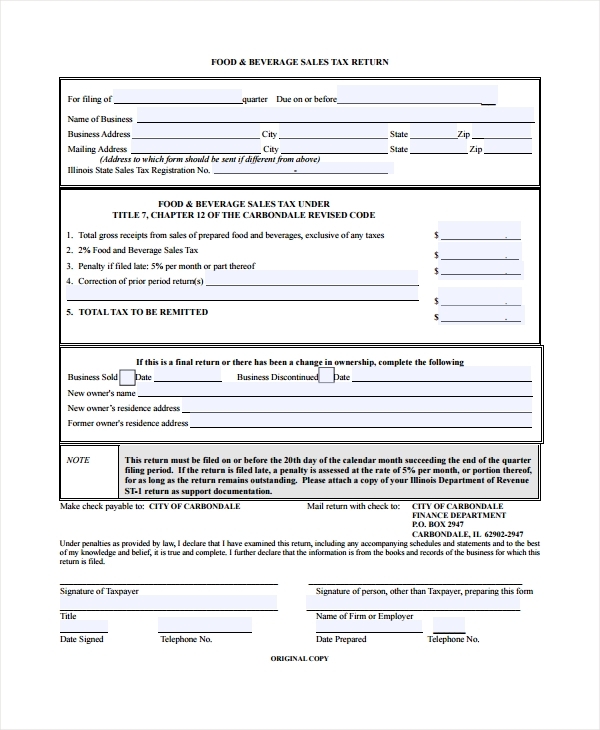 This form is also essential for restaurants who have a large number of employees since there are certain taxes to be paid individually for each hired employee. However, the employee should be informed about the taxes by indicating the amount and payroll breakdown percentage on the restaurant contract presented to him during the hiring procedure. Another type of tax that needs to be submitted regularly to the authorized government agency is the sales tax. This is acquired from the purchases of the clients in the restaurant. 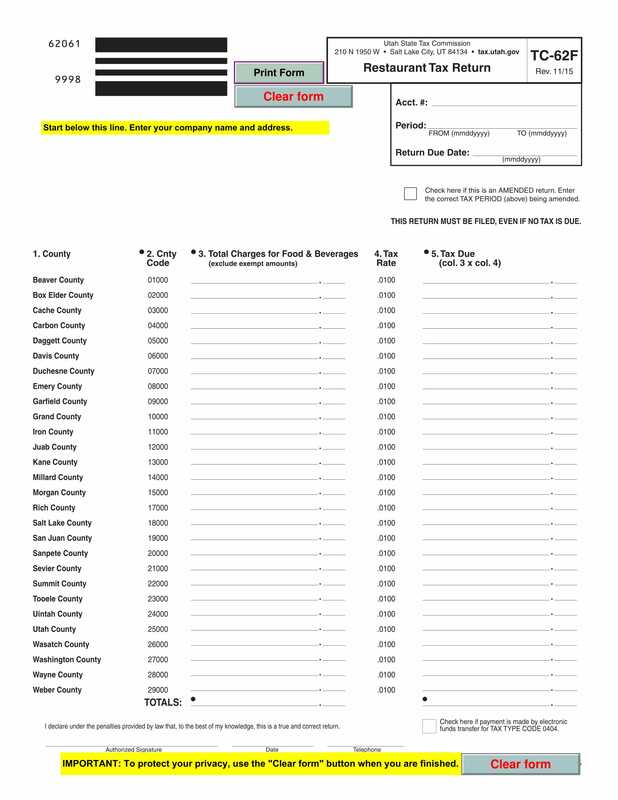 With this, a restaurant sales tax form is used quarterly to indicate the total gross receipts that the business acquired from the sales of their food and beverages. Although not all states demand a sales tax payment from restaurants, it is always a necessity that the management should properly create a restaurant plan for their menu regardless of the requirements. A well-detailed plan will allow the restaurant to operate flawlessly as well as obtain trust from sponsors who will sign the restaurant proposals. Paying the taxes of a business is as important as laying out the terms and conditions in a restaurant agreement form as well as completing a restaurant business plan. These taxes may not directly help the restaurant but it aids in contributing for supporting the community and the resources where the business is located. A restaurant lodging tax form is another type of restaurant business document that is allotted for determining the taxes of the lodging areas in a restaurant establishment. 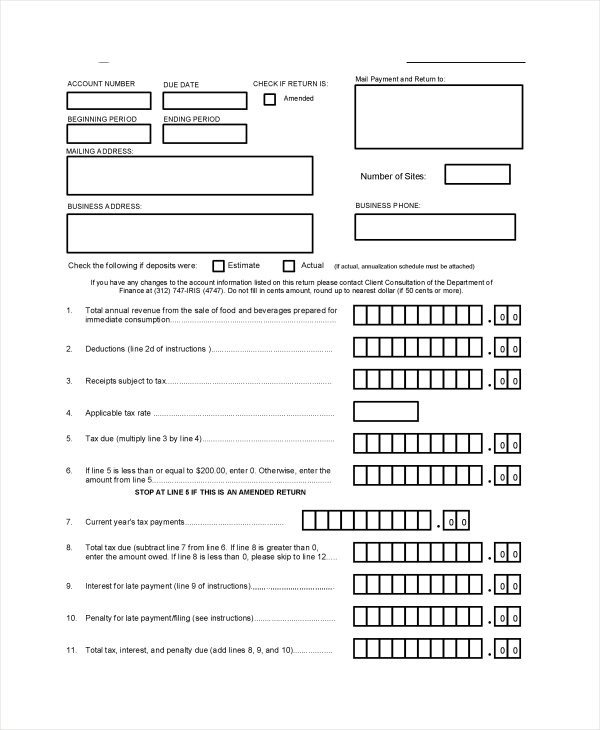 The form contains a section where the tax amount is disclosed by the owner and will then be computed by the authority. 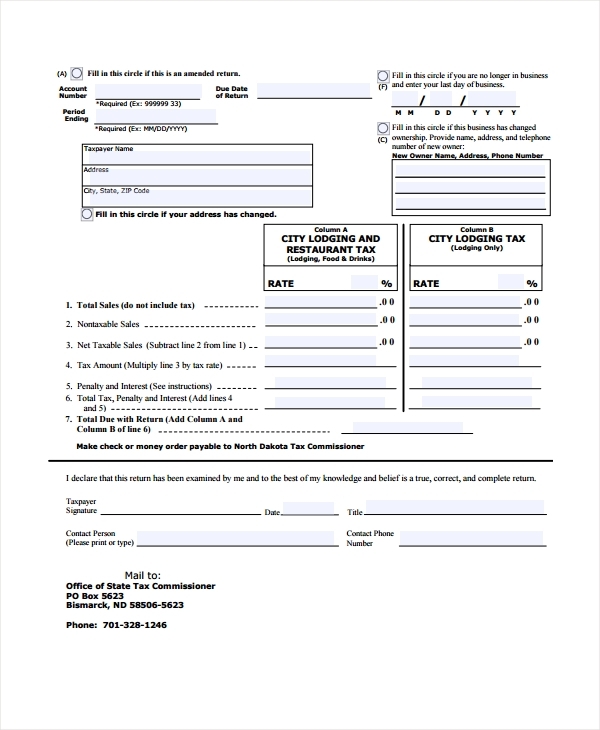 This last restaurant form template focuses not only on the sales tax returns but also on the overall tax return payment of the business. By keeping a duplicate of this document, the management will be able to construct a restaurant questionnaire with regards to whether they have fulfilled their tax obligations and take note of the payment amount for their monthly tax returns. Tax information – This refers to the tax account number of the business, the period or date prior to the tax due, as well as an indication of whether the amount to be disclosed and paid is an estimated or the actual amount based on the given tax period. This general information will aid the authority in searching for the restaurant business’s data in their system in order to update the tax obligations and details. Business contact information – The location of where the business is currently operating and their office contact numbers are stated in this contact information section. It is significant that the user of the form or the business owner will state the updated contacts to secure that notices and changes will be informed and reported to them by the authority immediately. Additionally, the name and position of the contact person who will be answering most of the authority’s inquiries and questions about the business should also be stated in this section. Sales information – This section focuses on the amount of food, beverage, and lodging sales that the restaurant was able to obtain within the tax period. Some states or tax government authorities will demand the computation for the gross sales to indicate in a breakdown in this section to assure that the all details are disclosed. The management must arrive at a taxable sales amount which will then be a contributing factor to the succeeding section, which is the tax computation. Tax computation – This serves as the last section where the management will be able to know their tax rates and how much they will need to provide for their tax obligations. However, in computing the tax amount, the management should assure that their tax claims are supported by the standards and are based on the rates of the state which will depend on the type of business being operated. Other than the aforementioned tax forms, restaurant owners must also prepare other documents such as restaurant evaluations and restaurant performance forms. These may not be legal documents that need the presence of an attorney but these papers will aid in sustaining equality as well as maintaining a bountiful relationship between the management and the staff of the business.